These changes, along with career years from Johnny Gaudreau (99 points) and Matthew Tkachuk (34 goals), helped the Flames to be the league’s third-best offense, at 3.52 goals per game. Their Mark Giordano-led defense was good enough in front of their below-average goaltending to win them the Pacific. Nathan MacKinnon, Mikko Rantanen and Gabriel Landeskog played 841 minutes together at even strength and dominated: 46 goals, a goals-for percentage of 61.33 and a 54.56 scoring chance percentage. 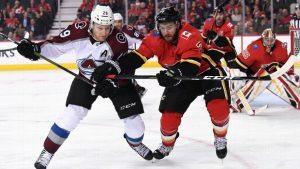 But Calgary’s Sean Monahan, Gaudreau and Lindholm were nearly as potent offensively in 823 minutes, with 52 goals, a 59.77 goals-for percentage and 52.56 percent of scoring chances. They were also a little better defensively, thanks in no small part to Lindholm joining up. It’s close, but we’ll still give the nod to MacKinnon’s group.